5,000 miles driven, 80 hours in the car, 12 states traversed, 18 meetings with donors, and 4 fundraising events attended. A vacation? Ha! Tiring? Absolutely! Hating being in the car right now? Oh yes! All worth it? You bet! Such is the life of missionaries. Having to raise not only personal support, but raising support for the organization we operate is just a part of our lives now. It’s a heavy responsibility, but part of the roles we accepted as directors and missionaries. We just celebrated our two year anniversary as missionaries (July 20) and have seen more of the States during that time than when we lived there. We love visiting new places and meeting new people, so all the travel is definitely worth it. What wasn’t mentioned in the opening paragraph is the fact that we were able to visit some pretty special places during that time. We were able to participate in much needed beach therapy at our favorite North Carolina location. The Good Doctor blessed us with great weather and protected us from shark attacks (which were happening all around us). 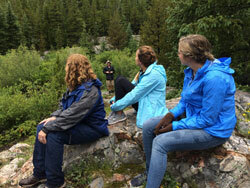 In addition to the beach we were also able to spend a couple of days at the lake with family and thanks to some very close and generous friends, several days in the mountains of Colorado. We absolutely fell in love with the Rockies and would love to return there. As many of you know, the best part of traveling is returning home. It was great returning to our own bed, our own pillows, and our own comforts of home, but the greatest thing was returning to the many smiles, hugs, and kind words. If you ever want to feel loved and appreciated, just spend some time away from the people around you. By the actions and responses of the kids here, I can truly say that we were missed. It was also heartwarming to find our offices decorated with pictures and words of encouragement from some of our missionary staff. We are blessed. Truly, truly blessed. As you can imagine, we returned to a line of people wanting and needing our time. Fortunately, in our absence there were no major problems or disasters. We have an excellent staff and have full confidence in them. So when we are away, we don’t worry. However, we were informed just this morning that they prefer to talk to us about problems because we are “more understanding and better listeners”. We appreciate this, but little do they know that we are just trying to figure out what they are saying. We are focused more on what is being said and trying to translate in our minds, than actually empathizing and listening to the problem. Well, at least that’s what I’m doing (Bryon). Tiffany may actually be getting it. Sierra received a GoPro camera for her birthday and had a blast filming all the activities she was able to participate in. And she did a great job editing and putting it all together into an entertaining video. If you have seen it, or plan to, just ignore the goofy laughing guy at the very end. I don’t know who that is. 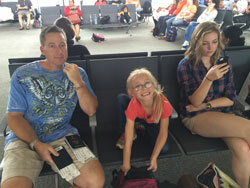 Aramie - Our little high-energy/social butterfly/outdoor adventurer had a blast in the States. She has adapted into a great little traveler and loved the hours of screen time in the car. In Colorado we found the perfect activity for her. We called it the Hamster Ball, because that’s exactly what she looked like when inside. It was an inflatable ball, set on the top of a pond. Because it was on the water, she had a difficult time standing and became exhausted in a matter of minutes. We’re trying to find one for our house. Jaqui - During our absence, the person who missed us the most was Jaqui. She sincerely loves being a part of our family and upon our return couldn’t stop talking for the first 3 days. It’s a privilege to call her ours and we love being her parents. 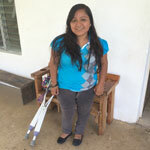 After 2 surgeries, Leti is close to walking again. God has been so good to continue to provide what this precious girl has needed over the last 1.5 years. 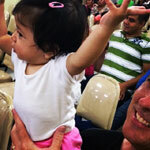 Mimi, one of our youngest kids, loves to worship. We were glad to have Realife (James River Youth) come, visit and do a concert in town. What a joy to see kids of all age with hands raised in adoration for our Lord! 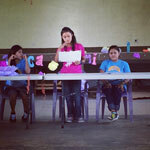 3 of our older girls moved to Casa Magdalena, our transition home, this month. We are very proud of them all and look forward to seeing them embrace this next stage in life. While at the beach, we were able to spend time with Aramie's birth family. Aramie loved seeing them and playing with her brother in the sand.